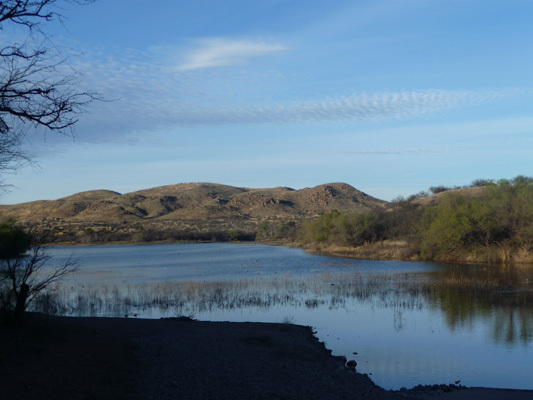 On Thursday February 19th we motored south from Tucson on I-19 to Amado and then west to Arivaca Lake, a small lake south of the little town of Arivaca out in the grasslands. The road was paved most of the way but had lots of small potholes and was pretty uneven because there were lots of poorly filled potholes too. We took it slow and thought everything was fine. The last mile or so to the lake is dirt and then you come out into the parking area for the boat launch and dock. There are several dispersed camping spots there and after studying the situation for a while we ended up with this nice spot with a view of the lake from our dining room windows. The water in the lake is pretty far up though there are wetlands around the edge where clearly it can go higher when the rains come. On Saturday, we talked to some folks who said that the lake was down 15 feet last year and they were thrilled to have it so full. 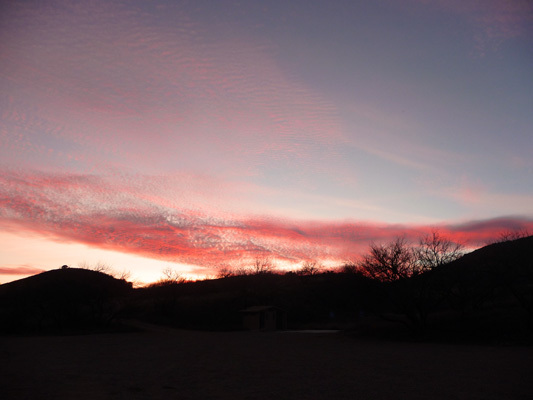 There are nifty hills to the east and the high clouds of the morning were gone. We got everything set up and came inside and only then did we notice that both of the bedroom drawers had come out during the drive and were upside down on the bedroom floor. Lovely. We gathered up all of our underwear and miscellaneous stuff from the floor and when we started to put the drawers back in we noticed that one of the top drawer’s slide guides/locks had broken out entirely from the underside of the drawer (in fact had broken out part of the plywood of the drawer). Oh Joy. After lunch we investigated a bit more and discovered that the bottom drawer’s guides had both broken out and were still in the cabinet—just peeled a layer of the plywood right off. While the drawer went in, it didn’t slide worth a darn any longer. The top drawer went back in and worked properly but repairing it looked a bit more tricky since the plywood laminate broke out in a chunk. Here were were just 2 days after our last repair appointment and we had a new problem. Well, it does keep things interesting. Later we took another look at the upper drawer and the other guide pulled out too. We figure some clamps and gorilla glue or epoxy would do the job (and we were right). Then Walter developed a plan to assure that the drawers stay in place so we don’t have to rely on the passive latches at the back of the drawers to keep things secure. We had a quiet afternoon nap and then Walter went out for a stroll along the lake to watch the birds. 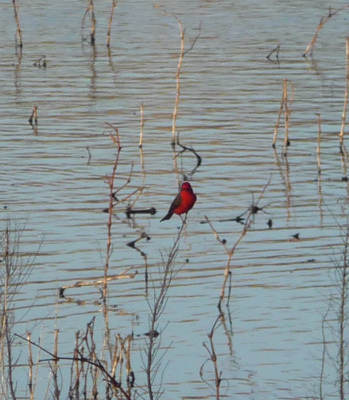 He came back in to inform me he’d spotted a vermillion flycatcher so I had to go and see too. 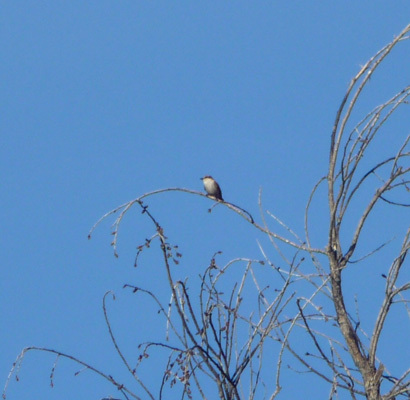 This little guy would swoop out, catch a bug and then return to his flimsy little branch. Great fun to watch and pretty too. I spied a female in the treetop swooping out and back too. 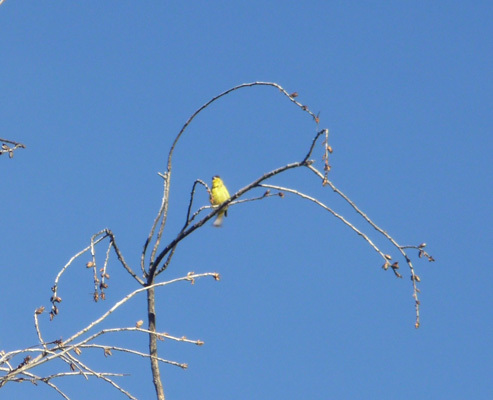 Not far from her, I saw what we think is a yellow warbler or maybe a Lawrence's goldfinch. It turns out the lesser goldfinches aren’t that yellow down here so that’s why we think this is a warbler or the Lawrence's. From a distance, who knows? The lake was very pretty in the afternoon light. And the hills to the east were spiffy reflected in the shallows. We even had a bit of a sunset as the clouds started to come in that evening. We awoke to mostly cloudy skies and fishermen coming to launch their boats first thing in the morning (7 am). We ran the generator since the solar panels don’t do much when it’s cloudy and then set out for another stroll on the lakeshore. 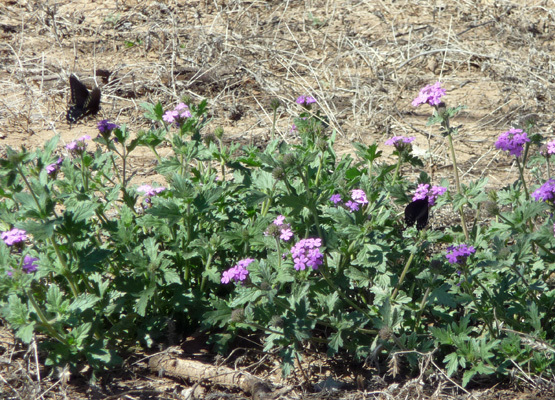 There was a little bit of verbena in bloom here and there along the banks. I don’t know if this is a true wildflower or just an escaped garden variety but we saw a lot of it over the next few days. In fact, it is a native: Desert Sand Verbena (Abronia villosa). 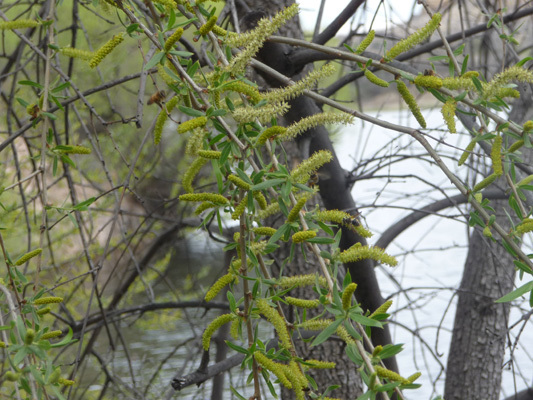 The willows along the lake were in bloom and so full of bees that you could hear them humming from way down the trail. As we walked along the shore we got a view back towards the boat launch and the hills to the east. To the west there were some fun hoodoos. All morning and afternoon folks kept driving in, hopping out of their cars (and motorcycles) and taking a look at the lake before driving off again. The day before there’d been only one couple who drove in just after we arrived. Ah well, maybe it was because it was Friday. Who knows? The fishermen and their boats started to arrive at 6 am on Saturday morning (long before sunrise). By 8 am there were 5 boat trailers parked around us and two pickup trucks belonging to fishermen who were fishing from the shore. 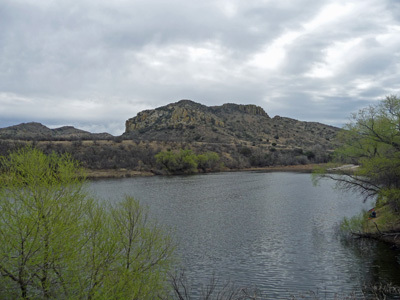 It turns out that this is THE place to fish for big mouth bass in the area even though they have so much mercury in them that you have to throw them back. One fellow said he’d caught 9, 10 and 12 1/2 pound bass here this year. We packed up the trailer and waited until about 10 am when there seemed to be a lull in the boat arrivals and cautiously drove up the narrow dirt road that leads from the lake. We made it out onto the two-way pavement without meeting anybody and gave a great sigh of relief. And then met a group of about 10 motorcycles out for a Saturday drive! 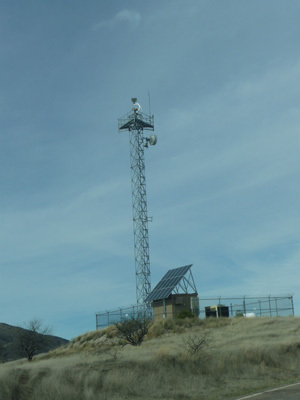 There’s a very large Border Patrol tower on the Ruby Road near Arivaca Lake. On Thursday when we drove in there was a truck there. But on Saturday it appeared to be operated remotely. We even had a Border Patrol guy come out and bump along the 2-track at the edge of the lake on Friday afternoon. That’s what you get when you’re less than 15 miles from the border. 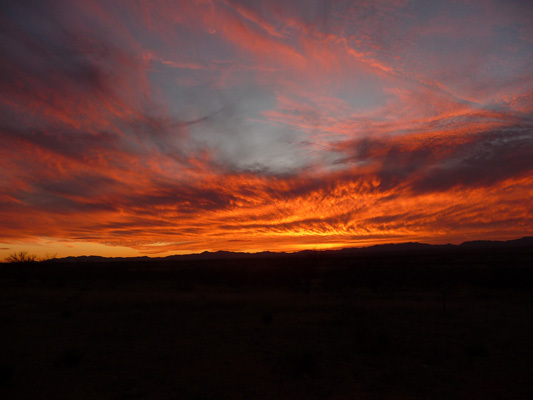 We drove west out of Arivaca until we hit Highway 238 and then went south to the Visitor’s Center for the Buenos Aires National Wildlife Refuge. There are about 80 free dispersed camping sites in the refuge but they’re all numbered and you need a map to find them. We got the map ($3) and talked to the hosts at the Visitor Center about the best places to camp. With their encouragement, we dropped the trailer and went out to look at several spots. The first one had a great view but was occupied. The second was so far from level we didn’t think we could manage it. 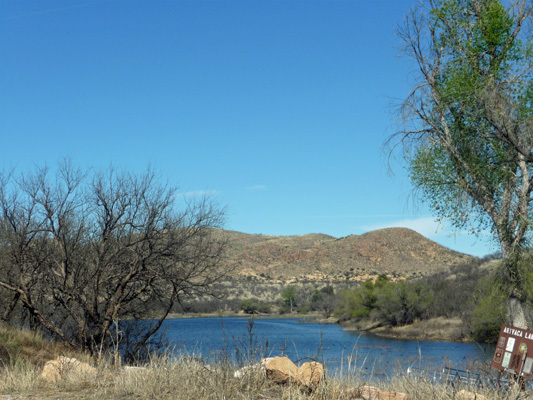 But finally we found a nice spot with a great view up on the ridge off Arivaca Road and put our camp chairs out to reserve it. We drove back to the Visitor’s Center, asked about which hikes would be best for the next day and decided that we should take the Pronghorn Drive down by the Visitor’s Center so we wouldn’t have to drive down there again the next day. The 10-mile drive takes you through the grasslands with the hope of seeing Pronghorn Antelope. No luck, but we did get to play leapfrog with a Border Patrol agent the whole way. You get some nice views of the Altar Valley and the Baboquivari Mountains to the west. 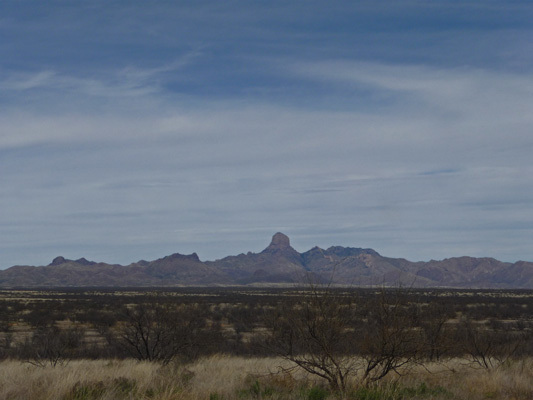 The tall peak is Baboquivari Peak, the sacred mountain of the Tohono O’odham Indians whose reservation is just west of here. We finished the drive and then went and picked up the trailer at the Visitor’s Center and drove on back up to our campsite to settle in. When we’d finished setting up Walter noticed a snakeskin in the grass in front of the trailer. 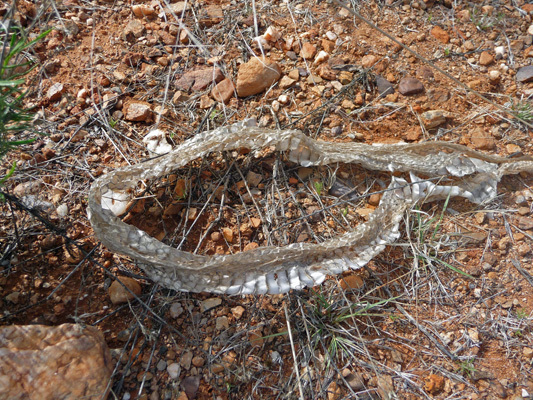 There are 12 kinds of rattlesnakes in the area (13 in Arizona) so we figure this was shed by a rattler of some sort this past season. That evening Mother Nature put on a great show. Peaking to a wonderful orange and red crescendo. 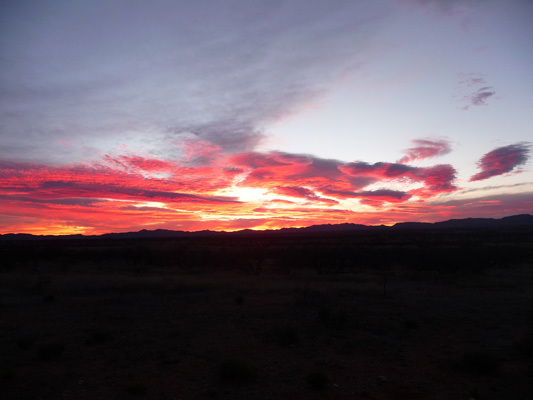 Sunday morning February 22nd, we awoke to the sound of trucks rumbling by at about 6:30 am—javelina hunters off to try their luck! 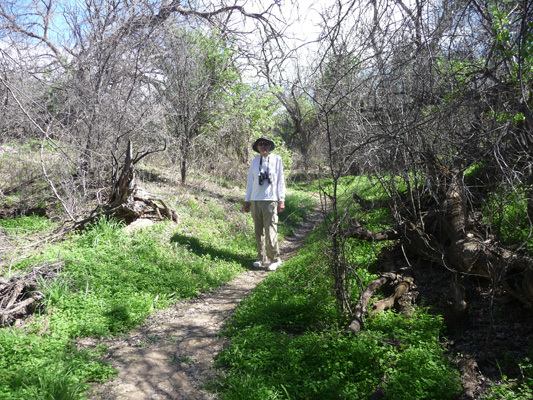 We had a quiet morning once they passed and then set out back to Arivaca and the hike at the Arivaca Cienega, where there are a series of 7 springs that attract wildlife in the area. 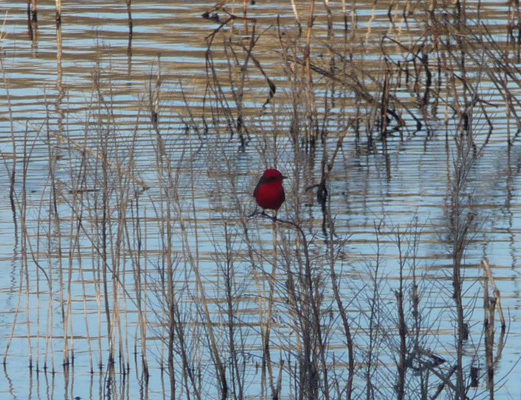 We spotted our first real cardinal in a thicket and several more vermillion flycatchers. 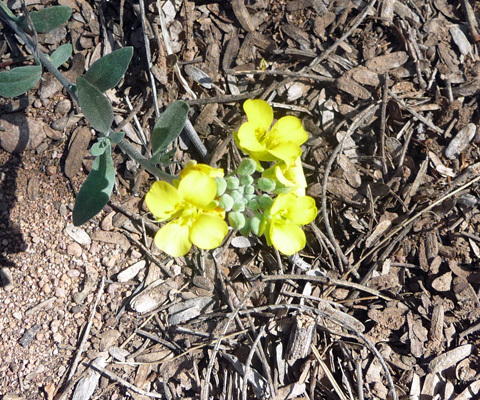 There were a few of these sweet little yellow flowers in bloom along the trail. I don’t know what they are but we saw masses of them along the road on our drive out on Monday the 23rd. 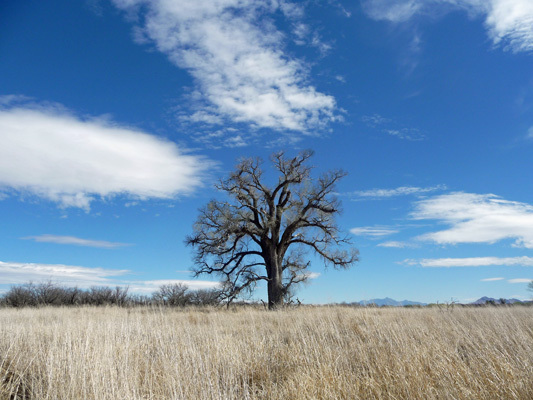 There are lots of cottonwoods in the area just starting to leaf out. This big old guy was standing by himself out in the grasslands. 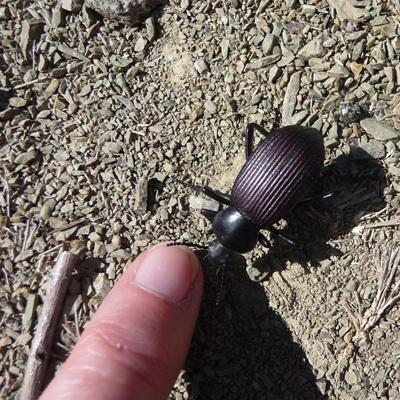 Our other wildlife sighting was a huge beetle in the middle of the trail. There were lots of birdwatchers here and we did see a lot of birds but most of them didn’t stay still to be photographed. 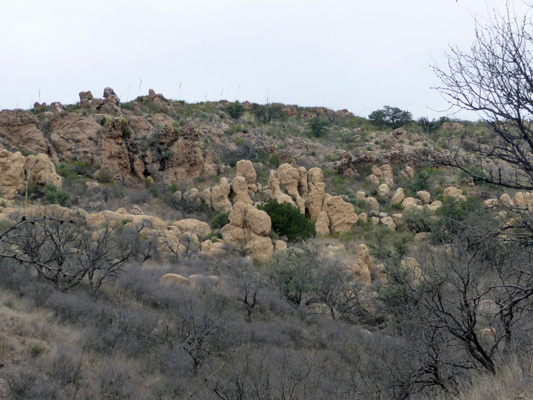 The hike is only about a mile and a half so when we were done we climbed back into the truck and drove a few miles west to the Arivaca Creek trail. 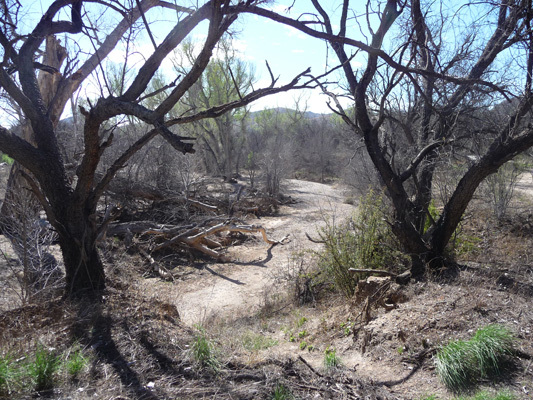 Arivaca Creek is a seasonal creek that usually has water in it in during the summer monsoon. 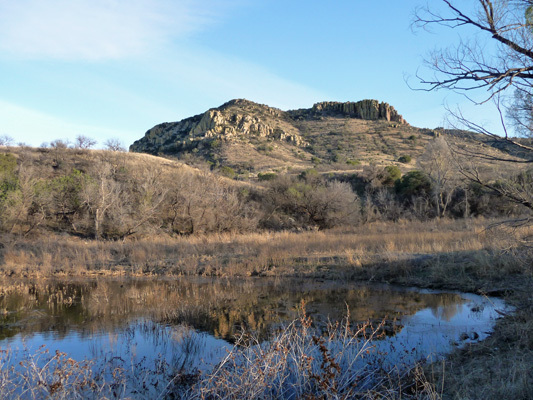 It provides a stopping over spot for summer migrating songbirds who flock here. We walked a ways out along the grassy trail. 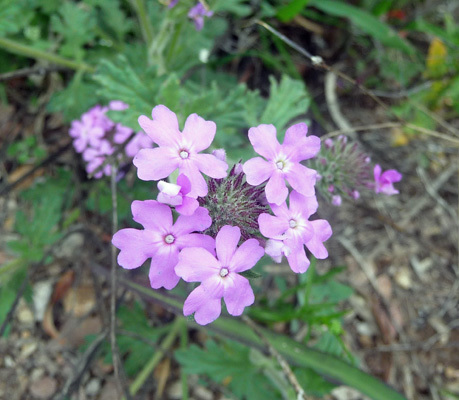 There were lots of weeds and things that looked like members of the dandelion family but only verbena in bloom. We came to a nice bench and sat down with a view of a little marshy spot. 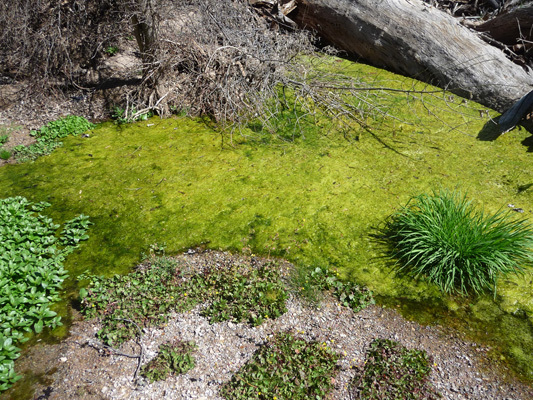 When I stepped out onto the sand bar to take a photo, a frog jumped into the middle of the algae patch and disappeared—kerplop! 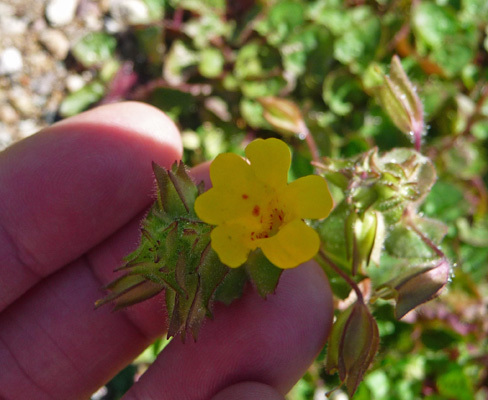 There were tiny little mimulus (monkey flowers) in bloom along the edge. All through the refuge we’d been seeing these black butterflies flit by. But only here at the trailhead near our truck did any of them actually stay still long enough for me to get a photo. When they’re on the move they look black but in close up view you can see they have orange and white spots. 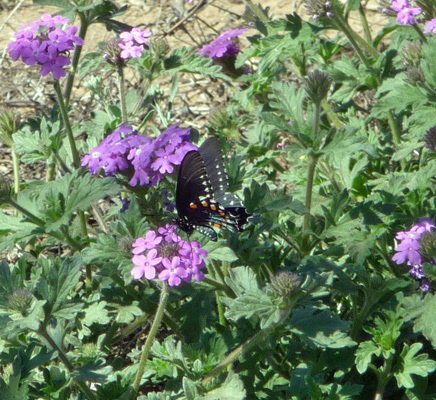 They're Pipevine Swallowtail Butterflies. That evening Mother Nature outdid herself and lit up the sky. And then hit a high note to finish. 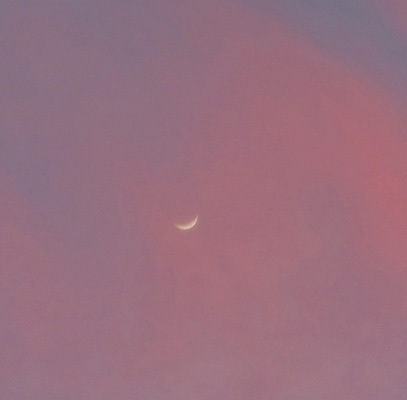 I looked up at one point to see that the sky overhead was pink and the new moon was hanging right overhead. It was windy both days we were here. I suspect that it usually is. 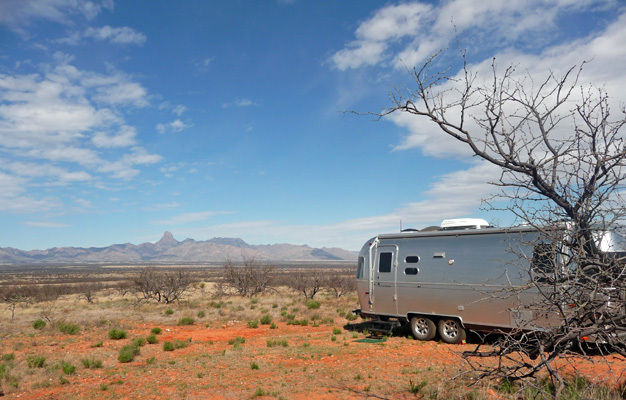 The first cattle rancher who owned this land named it Buenos Ayres for it’s wonderful breezes and breezy it was! This was a great place to camp. We had a decent hot spot signal, a beautiful view, lots of privacy and a few nice birdwatching hikes nearby. 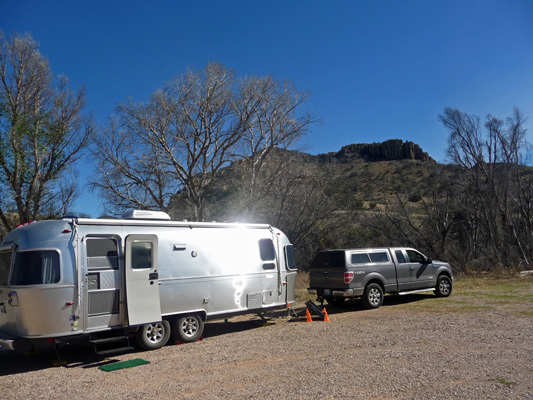 On Monday February 23rd, we packed up and drove back east on Arivaca Road to Amado for a couple of days of RV park camping at the De Anza RV Resort. We made a quick run to the Ace Hardware store in Green Valley and managed to get the things we needed to repair our bedroom drawers. 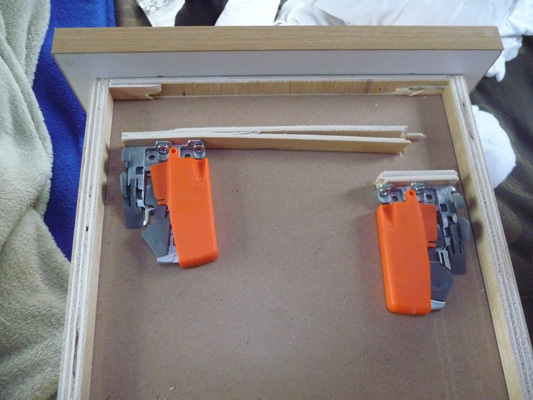 We used Gorilla Glue and 4 clamps to re-glue the broken plywood pieces and the drawers went back in and are working perfectly again. Ahhhh. Walter is finishing his installation of our new safety system to keep them in place on rough roads as I type. On Tuesday, we’ll do laundry and a few other chores and plan the next leg of our trip.